We will carry out any COSHH Risk Assessment and take care of waste disposal requirements. Industrial cleaning is very different to the normal cleaning that we carry out around our homes and offices. Not only can the scale of the job be much bigger, but it also involves a range of unique and specialist machinery for use on different surfaces and at different levels. Industrial cleaning can also be a riskier operation due to production machinery and ‘hard hat’ environments. Industrial cleaning includes working at high levels, the cleaning of plant floors, working in warehouses and often in manufacturing plants. Staff involved in such cleaning are highly trained, have comprehensive Health and Safety knowledge and lots of experience with specialist equipment and hazardous materials. Industrial cleaning Gloucester and Cheltenham Industrial Cleaning can both be carried out by or expertly trained staff. Industrial environments have unique needs that private and commercial premises don’t have. For example, a plant floor might need degreasing or ducts and cladding might need washing. High level lighting might need cleaning or even specialist manufacturing equipment. Due to the nature of the environment, specialist cleaning materials and methods are employed which can remove heavy-duty grime whilst protecting surfaces at the same time. Industrial cleaning can be exciting, challenging and fast-paced too. A cleaning team has to think on their feet and solve tough cleaning jobs in creative and effective ways. It’s also not a job to put on the back burner. Accidents can occur when build-ups of dust are allowed to accumulate. Factory dust can be combustible so it’s essential to deal with cleaning up such things before they turn into workplace hazards. As well as improving safety and well-being, employing the services of an industrial cleaning team can also help a businesses bottom line. If your machinery breaks or suffers a malfunction due to debris, dust or grime accumulation, then production grinds to a halt. Any down time will have a significant impact on productivity and profit levels, so it pays to be proactive rather than reactive when it comes to keeping a factory floor clean. Industrial cleaning jobs also involve the use of some pretty cutting-edge technology. Hydroblasters are high-pressure water jets that are used to wash large areas effectively in a quicker time and can have up to 50,000 psi. 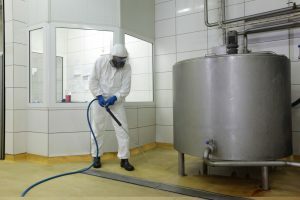 Recent technological advances have transformed the way industrial cleaners do their jobs, even sometimes using robotic cleaning tools for hard to reach or dangerous jobs. Staying in touch with the latest developments in both equipment and cleaning methods, cleaning in this sector has become much more tech-savvy and specialist than ever before. 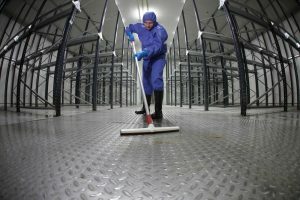 You might think that industrial cleaning is simply the dull process of scrubbing factory floors, but when you think of the scope of the projects it can be involved in, it’s quite exciting! A team could be called to an emergency spill on a motorway or factory site, they could be called on to clean out tanks, silos or storage facilities. Hydroblasting hazardous materials off machinery is another task, operating a vacuum truck for waste disposal or sanitising food production processing plants. All of these jobs are extremely important for keeping the public safe.